Myocarditis, also known as inflammatory cardiomyopathy, is inflammation of the heart muscle. Symptoms can include shortness of breath, chest pain, decreased ability to exercise, and an irregular heartbeat. The duration of problems can vary from hours to months. Complications may include heart failure due to dilated cardiomyopathy or cardiac arrest. Myocarditis is most often due to a viral infection. Other causes include bacterial infections, certain medications, toxins, and autoimmune disorders. A diagnosis may be supported by an electrocardiogram (ECG), increased troponin, heart MRI, and occasionally a heart biopsy. An ultrasound of the heart is important to rule out other potential causes such as heart valve problems. Treatment depends on both the severity and the cause. Medications such as ACE inhibitors, beta blockers, and diuretics are often used. A period of no exercise is typically recommended during recovery. Corticosteroids or intravenous immunoglobulin (IVIG) may be useful in certain cases. In severe cases an implantable cardiac defibrillator or heart transplant may be recommended. In 2013, about 1.5 million cases of acute myocarditis occurred. While people of all ages are affected, the young are most often affected. It is slightly more common in males than females. Most cases are mild. In 2015 cardiomyopathy, including myocarditis, resulted in 354,000 deaths up from 294,000 in 1990. The initial descriptions of the condition are from the mid-1800s. Symptoms in young children tend to be more nonspecific, with generalized malaise, poor appetite, abdominal pain, and chronic cough. Later stages of the illness will present with respiratory symptoms with increased work of breathing, and is often mistaken for asthma. Since myocarditis is often due to a viral illness, many patients give a history of symptoms consistent with a recent viral infection, including fever, rash, diarrhea, joint pains, and easily becoming tired. Myocarditis is often associated with pericarditis, and many people with myocarditis present with signs and symptoms that suggest myocarditis and pericarditis at the same time. A large number of causes of myocarditis have been identified, but often a cause cannot be found. In Europe and North America, viruses are common culprits. Worldwide, however, the most common cause is Chagas' disease, an illness endemic to Central and South America that is due to infection by the protozoan Trypanosoma cruzi. Bacterial myocarditis is rare in patients without immunodeficiency. Myocarditis refers to an underlying process that causes inflammation and injury of the heart. It does not refer to inflammation of the heart as a consequence of some other insult. Many secondary causes, such as a heart attack, can lead to inflammation of the myocardium and therefore the diagnosis of myocarditis cannot be made by evidence of inflammation of the myocardium alone. Myocardial inflammation can be suspected on the basis of electrocardiographic (ECG) results, elevated C-reactive protein (CRP) and/or Erythrocyte sedimentation rate (ESR), and increased IgM (serology) against viruses known to affect the myocardium. Markers of myocardial damage (troponin or creatine kinase cardiac isoenzymes) are elevated. The ECG findings most commonly seen in myocarditis are diffuse T wave inversions; saddle-shaped ST-segment elevations may be present (these are also seen in pericarditis). The gold standard is still biopsy of the myocardium, in general done in the setting of angiography. A small tissue sample of the endocardium and myocardium is taken, and investigated by a pathologist by light microscopy and—if necessary—immunochemistry and special staining methods. Histopathological features are myocardial interstitium with abundant edema and inflammatory infiltrate, rich in lymphocytes and macrophages. Focal destruction of myocytes explains the myocardial pump failure. Cardiac magnetic resonance imaging (cMRI or CMR) has been shown to be very useful in diagnosing myocarditis by visualizing markers for inflammation of the myocardium. Recently, consensus criteria for the diagnosis of myocarditis by CMR have been published. As with most viral infections, symptomatic treatment is the only form of therapy for most forms of myocarditis. In the acute phase, supportive therapy, including bed rest, is indicated. In people with symptoms, digoxin and diuretics may help. For people with moderate to severe dysfunction, cardiac function can be supported by use of inotropes such as milrinone in the acute phase, followed by oral therapy with ACE inhibitors when tolerated. In several small case series and randomized control trials, systemic corticosteroids have shown to have beneficial effects in people with proven myocarditis. However, data on the usefulness of corticosteroids should be interpreted with caution, since 58% of adults recover spontaneously, while most studies on children lack control groups. A 2015 Cochrane review found no evidence of benefit of using intravenous immunoglobulin (IVIG) in adults and tentative benefit in certain children. It is not recommended routinely until there is better evidence. People who do not respond to conventional therapy are candidates for bridge therapy with left ventricular assist devices. Heart transplantation is reserved for people who fail to improve with conventional therapy. Extracorporeal membrane oxygenation may be used in those who are about to go into cardiac arrest. Studies have shown no benefit for the use of herbal medicine on all cause mortality in viral myocarditis. The exact incidence of myocarditis is unknown. However, in series of routine autopsies, 1–9% of all patients had evidence of myocardial inflammation. In young adults, up to 20% of all cases of sudden death are due to myocarditis. Among patients with HIV, myocarditis is the most common cardiac pathological finding at autopsy, with a prevalence of 50% or more. Cases of myocarditis have been documented as early as the 1600s, but the term "myocarditis", implying an inflammatory process of the myocardium, was introduced by German physician Joseph Friedrich Sobernheim in 1837. However, the term has been confused with other cardiovascular conditions, such as hypertension and ischemic heart disease. Following admonition regarding the indiscriminate use of myocarditis as a diagnosis from authorities such as British cardiologist Sir Thomas Lewis and American cardiologist and a co-founder of the American Heart Association Paul White, myocarditis was under-diagnosed. 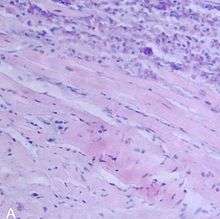 Although myocarditis is clinically and pathologically clearly defined as "inflammation of the myocardium", its definition, classification, diagnosis, and treatment are subject to continued controversy, but endomyocardial biopsy has helped define the natural history of myocarditis and clarify clinicopathological correlations. 1 2 3 4 5 Cooper LT, Jr (9 April 2009). "Myocarditis.". The New England journal of medicine. 360 (15): 1526–38. PMID 19357408. 1 2 3 4 Kindermann, I; Barth, C; Mahfoud, F; Ukena, C; Lenski, M; Yilmaz, A; Klingel, K; Kandolf, R; Sechtem, U; Cooper, LT; Böhm, M (28 February 2012). "Update on myocarditis.". Journal of the American College of Cardiology. 59 (9): 779–92. PMID 22361396. ↑ Willis, Monte; Homeister, Jonathon W.; Stone, James R. (2013). Cellular and Molecular Pathobiology of Cardiovascular Disease. Academic Press. p. 135. ISBN 9780124055254. ↑ Cunha, Burke A. (2009). Infectious Diseases in Critical Care Medicine. CRC Press. p. 263. ISBN 9781420019605. 1 2 3 4 5 6 Feldman AM, McNamara D (November 2000). "Myocarditis". N. Engl. J. Med. 343 (19): 1388–98. doi:10.1056/NEJM200011093431908. PMID 11070105. ↑ Eckart RE, Scoville SL, Campbell CL, et al. (December 2004). "Sudden death in young adults: a 25-year review of autopsies in military recruits". Ann. Intern. Med. 141 (11): 829–34. doi:10.7326/0003-4819-141-11-200412070-00005. PMID 15583223. ↑ Nicholson PJ, Quinn MJ, Dodd JD (December 2010). "Headshop heartache: acute mephedrone 'meow' myocarditis". Heart (British Cardiac Society). 96 (24): 2051–2. doi:10.1136/hrt.2010.209338. PMID 21062771. ↑ Skouri HN, Dec GW, Friedrich MG, Cooper LT (2006). "Noninvasive imaging in myocarditis". J. Am. Coll. Cardiol. 48 (10): 2085–93. doi:10.1016/j.jacc.2006.08.017. PMID 17112998. ↑ Friedrich MG, Sechtem U, Schulz-Menger J, Holmvang G, Alakija P, Cooper LT, White JA, Abdel-Aty H, Gutberlet M, Prasad S, Aletras AH, Laissy JP, Paterson I, Filipchuk NG, Kumar A, Pauschinger M, Liu P (2009). "Cardiovascular Magnetic Resonance in Myocarditis: A JACC White Paper". J. Am. Coll. Cardiol. 53 (17): 1475–87. doi:10.1016/j.jacc.2009.02.007. PMC 2743893 . PMID 19389557. 1 2 Hia, CP; Yip, WC; Tai, BC; Quek, SC (June 2004). "Immunosuppressive therapy in acute myocarditis: an 18 year systematic review". Archives of Disease in Childhood. 89 (6): 580–4. doi:10.1136/adc.2003.034686. PMC 1719952 . PMID 15155409. 1 2 Aziz, KU; Patel, N; Sadullah, T; Tasneem, H; Thawerani, H; Talpur, S (October 2010). "Acute viral myocarditis: role of immunosuppression: a prospective randomised study". Cardiology in the young. 20 (5): 509–15. doi:10.1017/S1047951110000594. PMID 20584348. 1 2 Robinson, J; Hartling, L; Vandermeer, B; Klassen, TP (20 May 2015). "Intravenous immunoglobulin for presumed viral myocarditis in children and adults.". The Cochrane database of systematic reviews. 5: CD004370. doi:10.1002/14651858.CD004370.pub3. PMID 25992494. ↑ de Caen, AR; Berg, MD; Chameides, L; Gooden, CK; Hickey, RW; Scott, HF; Sutton, RM; Tijssen, JA; Topjian, A; van der Jagt, ÉW; Schexnayder, SM; Samson, RA (3 November 2015). "Part 12: Pediatric Advanced Life Support: 2015 American Heart Association Guidelines Update for Cardiopulmonary Resuscitation and Emergency Cardiovascular Care.". Circulation. 132 (18 Suppl 2): S526–42. doi:10.1161/cir.0000000000000266. PMID 26473000. ↑ Liu, ZL; Liu, ZJ; Liu, JP; Kwong, JS (28 August 2013). "Herbal medicines for viral myocarditis.". The Cochrane database of systematic reviews. 8: CD003711. doi:10.1002/14651858.CD003711.pub5. PMID 23986406. ↑ Cooper LT (April 2009). "Myocarditis". N. Engl. J. Med. 360 (15): 1526–35. doi:10.1056/NEJMra0800028. PMID 19357408. ↑ P. Schölmerich. (1983.) "Myocarditis — Cardiomyopathy Historic Survey and Definition", International Boehringer Mannheim Symposia, 1:5. ↑ Joseph Friedrich Sobernheim. (1837.) Praktische Diagnostik der inneren Krankheiten mit vorzueglicher Ruecksicht auf pathologische Anatomic. Hirschwald, Berlin, 117. 1 2 Eckhardt G. J. Olsen. (1985.) "What is myocarditis? ", Heart and Vessels, 1(1):S1-3. ↑ Jared W. Magnani; G. William Dec. (2006.) "Myocarditis", Circulation, 113:876-890.